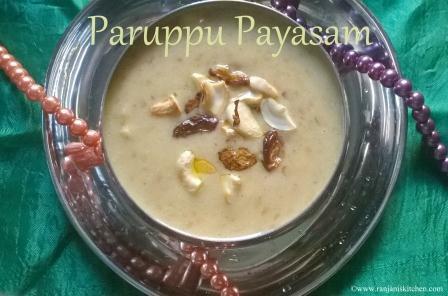 Paruppu payasam!! You can call it as moong dhal kheer/Moong dhal pudding as well J.. This is one of the highly nutritious dessert.. This payasam is all about simplicity made with moong dhal, jaggery and milk with a hint of aromatic ghee and nuts. Which is a common dessert in south indian houses for all occasions. Mash the cooked dhal using ladle. Keep it aside. Immerse jaggery in hot water for 10 mins.Then filter to remove the residues. Prepare ¼ cup of coconut milk from ½ cup of coconut. Heat a heavy bottomed pan,add 1 tbsp of ghee, roast the cashews and raisins in it. In the same pan, cook moong dhal+1/4 cup of water, once it starts boiling, add drained jaggery water and milk.Let it cook for 5 mins. Finally add coconut milk, Cardamom powder, cashews and raisins. Give a quick stir. Do not over cook after adding coconut milk. It will start to curdle. Now switch off the stove and add remaining 1 tbsp of ghee. 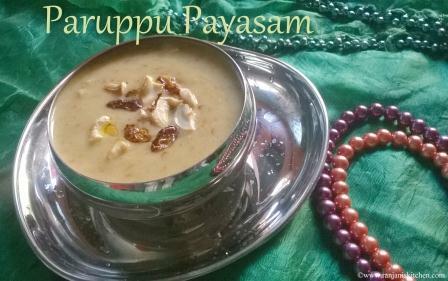 If you want to re-heat payasam, do not heat in stove. Boil some water in a bowl, keep payasam container inside the bowl. You can adjust the sweet level by adding jaggery. Also by adding more milk,you can adjust the consistency of payasam. Thanks gloria 🙂 Keep visting..